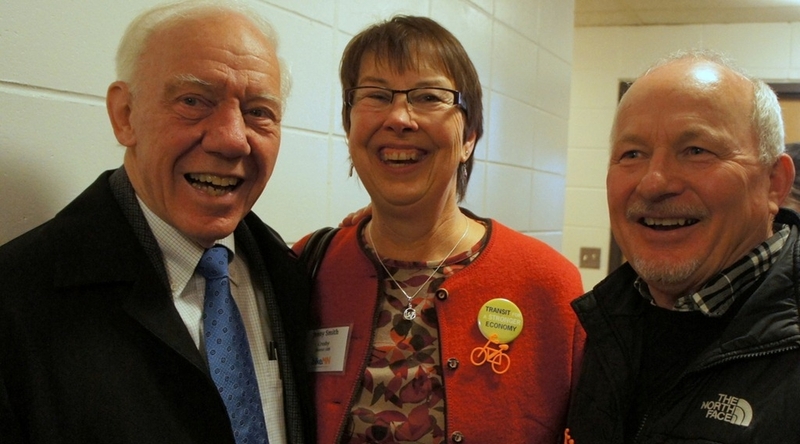 Former MN Congressman Jim Oberstar died unexpectedly last Saturday. His funeral was earlier today in the Washington DC area. If you’ve been a bicyclist in Minnesota for very long, you’re probably aware of his contributions. If not, see the links from Adventure Cycling here and here. I like those because they’re a couple years old. I briefly met Oberstar last year in St. Paul (blogged here) when he attended and spoke at the 2013 Minnesota Bicycle Summit. I knew at the time from my conversations with QBP’s Gary Sjoquist that Oberstar was able to secure (an earmark!) $750,000 of Federal highway funds (first time ever for a MTB trail) for the creation of the Cuyuna Lakes Mountain Bike Trail System so I was pleased to get the above photo of him with two of my Cuyuna Lakes Mountain Bike Crew (CLMTBC) pals, John Schaubach and Jenny Smith. 2005 – IMBA’s Jenn Dice suggests to Tim Wegner that MN 8th District Congressman Jim Oberstar might be able to help with funding. Wegner drafts a request for a federal transportation grant which he and [Gary] Sjoquist present to Oberstar in Washington, DC. When President Bush signs the 2005 federal transportation bill in July, 750,000 is earmarked for the CCSRA [Cuyuna Country State Recreation Area] to be administered through MN Department of Transportation to the MN DNR.